In yesterday's post, S&P 500 Chart - Depends On How You Look At It... , I talked about two specific possible outcomes for the S&P 500 (one bullish, one bearish). My view at the time was bearish, and that the S&P was forming a rounding top and was poised to break lower in the short-term. 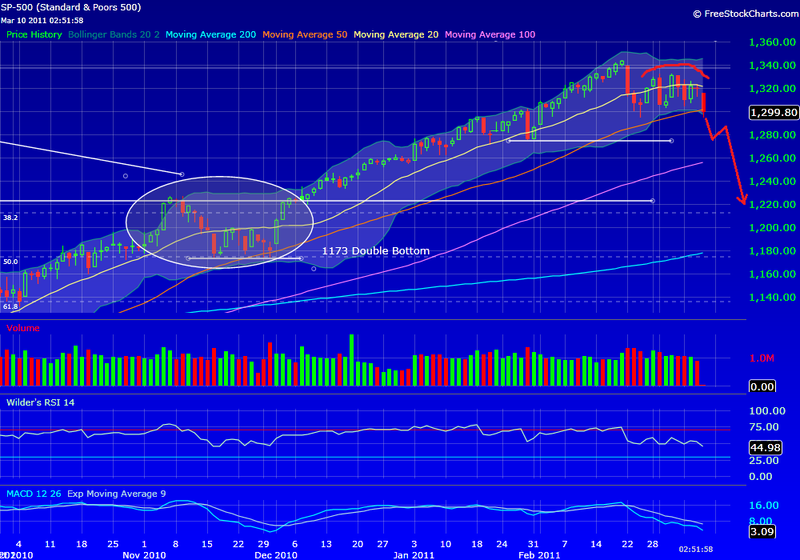 The S&P 500 is currently trading down around 20 points at 1300, confirming the rounding top scenario in my opinion. We tested the Feb 24 lows @ 1294 earlier this am, and have so far held. I am aware of the possibility that we could form a double bottom at 1294/1295, similar to what we saw back in November @ 1173. However I think there are a number of factors that will push the S&P below 1294/1295 in the near-term and eventually test the 1220/1230 level. In addition to the unrest in the Mideast, seasonally we are coming up to a period that has not always been kind to stocks. I am also concerned about the amount of money that has come off the sidelines and into stocks over the past couple of months. That is never a good sign. And the wild card, QE2, is scheduled to end in June. June is still a few months away, but the market will start discounting the removal of economic stimulus long before it actually happens. This week could be the beginning of that discounting. Technically the RSI and MACD have turned lower, and a large number of market leaders' charts have begin to turn lower over the past week or so. Once 1294 gives way I am looking for an initial test of 1275, and then eventually 1220/1230. This scenario suggests an additional 6% correction from current levels. As the market corrects I will have a shopping list of bargain stocks that I will start chipping away at. That shopping list will be the topic of a future post. Now is not the time to start buying the dips.